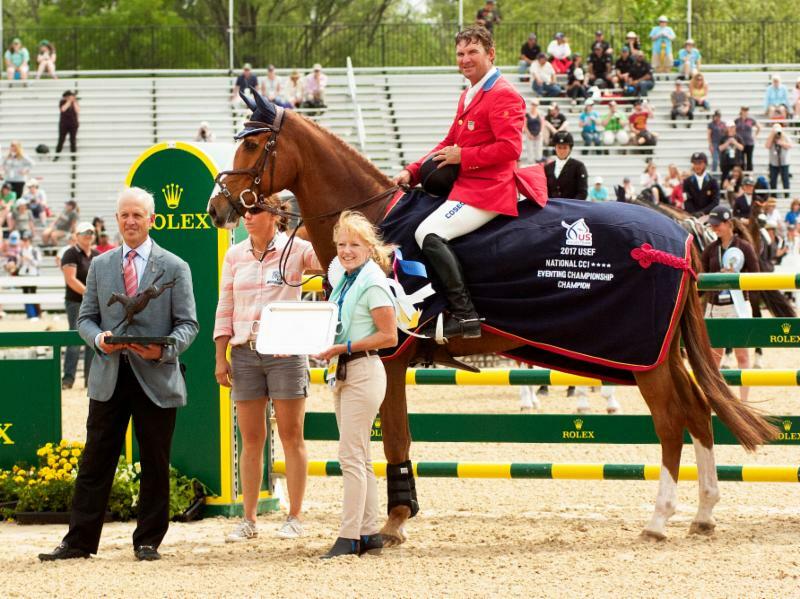 Lexington, KY, April 30, 2017-In the 39-year history of the Rolex Kentucky Three-Day Event, presented by Land Rover, only three riders have ever managed to win two years in a row. 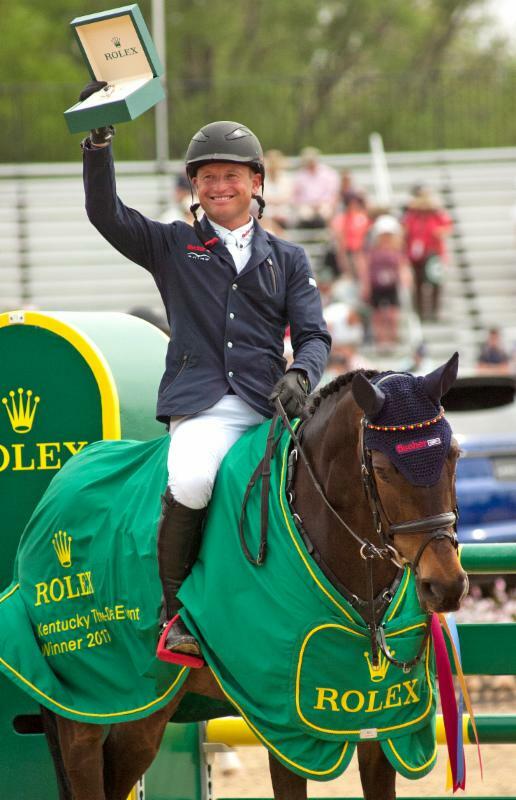 But Michael Jung made history by winning the 2017 Rolex Kentucky Three-Day Event for a third consecutive time aboard FischerRocana FST. The German duo lowered one rail in show jumping to finish on 42.7 penalties, just ahead of France’s Maxime Livio and Qalao Des Mers in second (44.6) and England’s Zara Tindall and High Kingdom in third (46.6). By placing fourth, a pair of U.S. veterans, Phillip Dutton and Mr. Medicott (54.6), who took home the Roger Haller Memorial Trophy for the Rolex/USEF CCI4* Eventing National Championship. 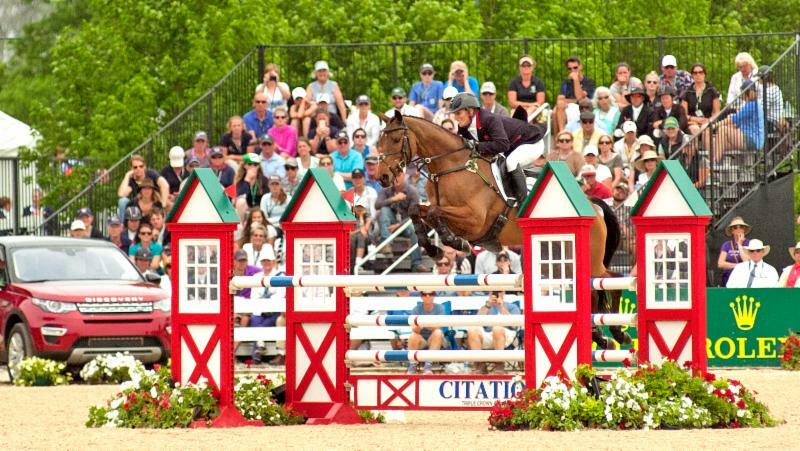 Dutton won the national championship for a record fifth time, and his finish this weekend on three horses gives him an astounding 40 completions at the Rolex Kentucky Three-Day Event, presented by Land Rover. 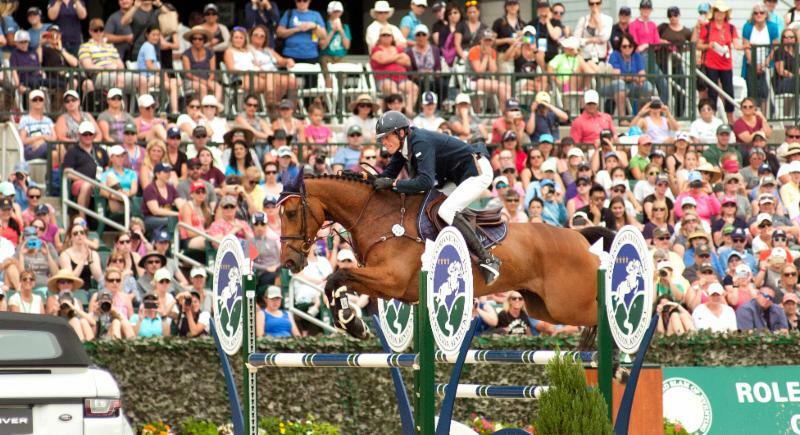 Show jumping day was hot and blustery, but that didn’t prevent 24,159 fans from packing the Rolex Stadium to see the best in the world compete for $400,000 in prize money. Double-clean rounds were few and far between, with only one coming in the first session, for Will Faudree and Pfun. There would only be three more in the second session, for Livio, Tindall and Kurt Martin on Delux Z. Dutton and Mr. Medicott would leave all the rails in the cups, but add 1 time penalty to his score. Jung, 34, Horb, Germany, would continue his streak of not being perfect, but still being good enough, by having a rail down in the triple combination. However, his six-point lead going in to the show jumping allowed for one mistake to claim the victory. Livio, 29, Saumur, France, had been chasing Jung all weekend, and he is the only person to have beaten him in recent memory, but he settled for second place today. His powerful double-clean round put the pressure on Jung as he cantered out of the ring. Tindall, 35, Gloucestershire, England, came in to this event keeping her expectations in check following a difficult trip to the Kentucky Horse Park two years ago where an injury in the stable prevented her from even starting. But each day she put in a sparkling performances to, like Livio, be one of only two to finish on their dressage score. “I’m obviously very lucky to come back and very thankful to my owner and to Land Rover and Rolex to be able to come back,” she said. “It’s great to be sitting up here with these guys. My horse was fantastic all the way through the competition -he jumped great today. Dutton, 53, West Grove, Pa., brought three horses to Kentucky, and all three finished in the top 10, with Fernhill Fugitive finishing eighth (63.0) and I’m Sew Ready finishing 10th (69.1). But it was his top placing mount, Mr. Medicott, who brought Dutton his fifth national championship. In the Dubarry of Ireland Nations Team Challenge, Team USA jumped out in front of the combined New Zealand/France/Germany team to win with a score of 179.2. The combined team finished second with 180.3 over Team Canada in third with 231.5. Team USA included Hannah Sue Burnett/Under Suspection, Boyd Martin/Cracker Jack, Dutton/Fernhill Fugitive, and Lauren Kieffer/Vermiculus. Prior to the show jumping, Buck Davidson retired his venerable mount Ballynoe Castle RM in front of cheering crowds. Buck and “Reggie’s” friends and family turned out to wish the Irish Sport Horse gelding a happy retirement. Davidson and his long-time groom Kathleen Blauth-Murray choked back tears as they draped him in flowers and a blanket commemorating his long career. 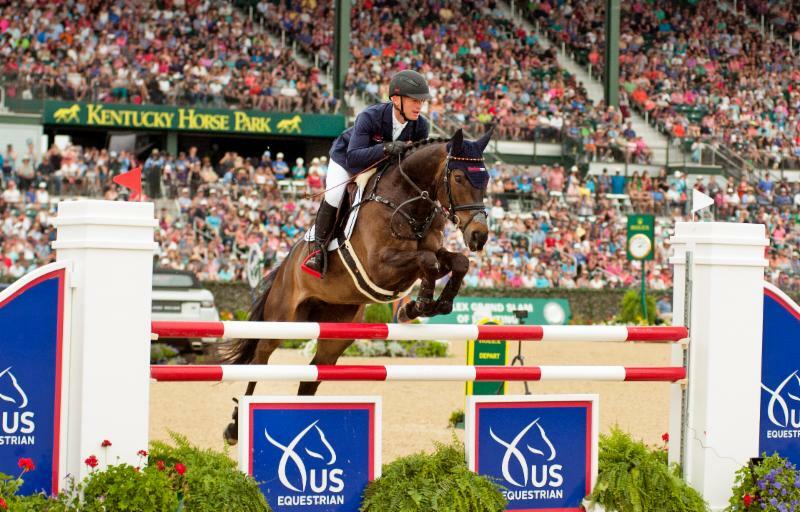 In all, 80,654 people came to the Kentucky Horse Park this weekend to enjoy amazing performances at the Rolex Kentucky Three-Day Event, presented by Land Rover. As happens more times then not this time of the year in Kentucky, the weather went from bad to great in a matter of a days. The weather for the Rolex Kentucky Three-Day Event: Cross Country Day started out a little chilly but soon warmed up and it turned into a gorgeous day. Many people have sun-burns to prove it, which if I can give one bit of advice, wear Sun Screen. Way to take the Lake. The jump at the Head of the Lake is always a crowd favorite and this year was no exception. We watched a number of horses through this jump and other then a few minor mis-steps they all completed it with authority. There were a few horses retired or eliminated over the length of the course but no major career ending injuries to any horse or rider and so that makes it a good Cross Country Day when everybody can come back another day. Lexington, KY — It was back to Rolex Outdoor Stadium today for the conclusion of the Eventing World Championships, presented by Reem Acra, where Germany’s Michael Jung (33.0) remained dominant and claimed the individual gold medal as Great Britain (139.4) took the team gold medal. Canada jumped to the team silver medal (151.5), just ahead of New Zealand (154.8) in the bronze-meal position. The United States finished fourth (160.3). William-Fox-Pitt led the British charge on Cool Mountain by claiming the individual silver medal (42.0), while Andrew Nicholson led the New Zealand charge on Nereo by claiming the individual bronze medal (43.5). Karin Donckers of Belgium finished fourth (44.4). Great Britain last won the World Championship team gold at the 1994 World Games, while Canada had not won a World Championship medal at all since winning the team gold medal at the 1978 World Championships here at the Kentucky Horse Park. 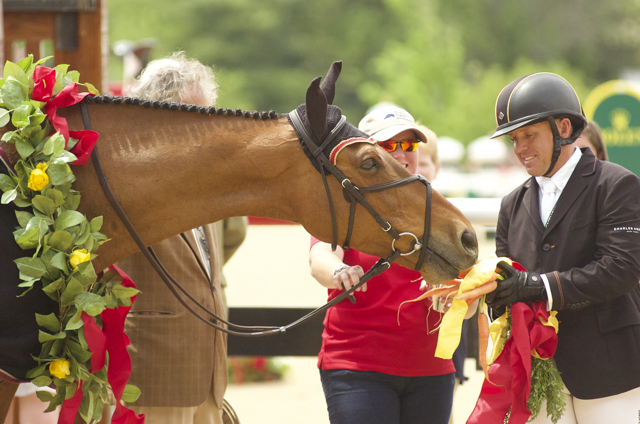 The Canadian riders said that they owe much of their success to coach David O’Connor, who won the team gold medal on the U.S. team at the 2002 World Games. The Canadians also praised O’Connor for helping with their mental game. Nicholson said he’d hoped New Zealand could earn a medal for the first time since winning the team gold at the 1998 World Games. Teammate Mark Todd, 54, competed in the 1978 World Championships at the Kentucky Horse Park before winning the individual gold medal in the 1984 and 1988 Olympics. He retired from eventing after the 2000 Olympics but decided to make a comeback two years ago. His top horse Gandalf died unexpectedly last winter, and he wasn’t sure Grass Valley would be ready for these World Games until a few months ago. But now he has a new wind in his sails. Jung remained atop the leader board throughout this championship on La Biosthetique-Sam FBW, finishing on their dressage score of just 33.00. Jung credits his success to the time he spends with the horse. Richard Jeffery’s show jumping course consisted of 16 elements to be jumped in a time allowed of 90 seconds. Some 22 of the 55 horse-and-rider combinations that started today’s final phase completed the course with double-clear rounds. The U.S.’s only individual combination, Becky Holder and Courageous Comet, stood third overall after yesterday’s cross-country phase, but Holder withdrew in the holding box at the third horse inspection this morning. Courageous Comet lost a front shoe on the early part of yesterday’s course and is thought to have over-compensated in the opposite leg. He is expected to make a full recovery. The Course for the final phase of Eventing, Stadium Jumping has been put online and it looks to be well thought out both from the horse/rider perspective as well as the spectator perspective. The link for the video of the map is provided below. course look easy at the Eventing World Championships, presented by Reem Acra. The pair added nothing to their dressage penalty score of 33.00, to keep the lead they took yesterday in the dressage phase at the Alltech FEI World Equestrian Games. Creeping up behind Jung after equally impressive rounds are Great Britain’s William Fox-Pitt on Cool Mountain, finishing on their dressage score of 42.00, and USA’s Becky Holder on Courageous Comet, finishing on 42.50. Of the 79 horses that started today’s course, 60 finished (75.9%). Some 13 riders, including Jung and Fox-Pitt, finished faster than the ideal time of 11:14 and added nothing to their dressage penalties. Despite the less-than-ideal preparation, Jung was thrilled with the course and La Biosthetique Sam FBW, 10, whom he has ridden since the gelding was 5 years old. Jung said that his plan for tonight was to have a drink, enjoy the being in the lead, and go to bed early. He praised his experience at the World Games thus far. Fox-Pitt and his British teammates hold a narrow lead in the team standings, with a total score of 139.4. The United States team holds second place (143.7), and Canada holds third (147.5). The remaining 60 horses will be presented to the ground jury in Sunday morning’s final horse inspection, and show jumping will begin at 12:45 p.m.
Iman du Golfe, ridden by Juan Carlos Garcia (ITA), was injured in a fall at fence 20. He was treated at Rood & Riddle Equine Hospital for a deep laceration over the left elbow region. X-rays showed no major fracture, although there is a small bone chip near the elbow. The laceration has been sutured, and the horse is resting comfortably. The Rood & Riddle attending veterinarians are optimistic that the horse will make a full recovery. Iman du Golfe, horse #73 ridden by Juan Carlos Garcia (ITA), was treated at Rood & Riddle Equine Hospital for a deep laceration over the left elbow region. X-rays showed no major fracture, although there is a small bone chip near the elbow. Iman du Golfe (ITA), horse number 73, was injured in a Cross-Country fall at fence 20 this afternoon at the Alltech FEI World Equestrian Games in Lexington, Kentucky. Veterinarians attended to the horse immediately. The horse was stabilized at the fence and transported by horse ambulance to the nearby Rood & Riddle veterinary hospital for further assessment and treatment. The rider, Juan Carlos Garcia, was taken to the hospital and initial reports are that he is in good condition. I was able to track down the Order of Go for today’s Cross Country and the map of the Course at the links listed below.